Travel – the very word either conjures up feelings of joy or dread, depending on what kind of responses it evokes in the mind when you picture planes, trains, beaches, cities, crowds of people and so on. For those who have had bad experiences on vacation, the idea of a week or two away can be something that is approached with caution, or even avoided completely. It’s a shame when the latter is true, because travel is a great way to experience the world first-hand, see how different cultures do things and enrich your own life. Working as a hypnotherapist in London, I see people who are travel-shy quite regularly. The most common reason why is that they have a fear of flying, but other modes of transport – including trains, boats and even cars – can all cause people to start wondering if going away is worth the effort. Other times, thoughts of going away can be a problem for people with a social phobia. The shock of the unknown and having to mingle with total strangers can be things that put people off booking their vacation. These are understandable feelings: for everyone who thinks their social skills are lacking and for whom a great day is a quiet one spent at home, the thought of trying to make small talk with taxi drivers or hotel reps or with random holidaymakers in bars can be too much. Behind all of these concerns is fear. The root cause of every single phobia is an event which happened at some point in the past and to which the brain has developed an aversion. For people who are afraid of dogs, it’s likely they were bitten by a dog or chased by a dog as a child. Or maybe a parent warned them of a local stray that liked to bite children. For a child with an active imagination, a book or a movie can easily provide the trigger, too. The same is true of air travel: you certainly don’t need to have walked away from a wrecked plane to have a fear of flying. Years of seeing newspaper photos and TV images of downed jets, as well as movies depicting tragedies in the skies, are all that many people need to associate aircraft with potential danger. To help clients at my hypnotherapy practice to try and get over the kinds of fear that stop them from going on vacation, I use techniques such as Havening, where specific fears can be “havened out”. More specifically, the fear associated with a memory is replaced with a warmer, less threatening feeling. Other techniques I use include NLP – neuro linguistic programming – which challenges inner self-talk and helps people to replace negative thoughts with more positive ones. Here are some other tips to try at home. They are chiefly aimed at people who have a morbid fear of flying, but they can equally be applied to trains and busy railway stations, ships and bustling ports, too. Avoid watching the news on the TV as there is always the chance that you will see news of an airline disaster that will send you into a panic. Statistically, aircraft are the safest way to get from A to B, so try to remind yourself of this rather than exposing yourself to any negative thoughts. Sitting happily on the airplane and enjoying the amazing view. Maybe you’re having a drink and enjoying the in-flight movie. Relaxing on the beach under a golden sun, or feeling the warm sea waters between your toes. Laughing and dancing on the sand as a salsa band plays behind you. Try and make these images as colorful, bright and appealing as you can. 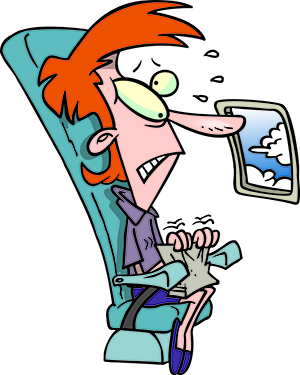 One of the most stressful places for nervous travelers is the airport. Common causes of concern are the ultra-serious people at security, police with large machine guns, ‘suspicious-looking’ fellow travelers and the sinking feeling that you have passed the point of no return and are about to embark. If any or all of the above set your mind whirring and nudge you towards panic at the airport, try a mindfulness technique known as STOP. First is the ‘S’, which stands for ‘stop’ – notice that you are feeling panicky and accept that it’s happening. Then comes the ‘T’ – take three deep, slow breaths. Next it is the ‘O’ – observe your thoughts, feelings and emotions: what is happening to you? Can you move on from it? Finally, ‘P’ means proceed – continue with a smile on your face and the knowledge that you have recognised your discomfort and challenged it. A very good way to bring down a racing pulse is known as Ha breathing. It has roots in ancient Pacific cultures and the idea is to breathe in slowly through your nose counting to three or four. Then breathe out through the mouth counting six or eight – just keep to the 1:2 ratio. It’s a good thing to try if turbulence starts to rock the plane, as is trying to tell yourself that turbulence is absolutely nothing to worry about. It’s the aerial equivalent of a mildly bumpy road on a car and planes are stress-tested to withstand whatever nature throws at them. Take a moment each day to stop and remind yourself where you are, how great it is, and how wonderful it is to be in the world today. Congratulate yourself on having the courage to see your vacation though, pat yourself on the back for getting on the aircraft, and visualise yourself in your seat on the flight over; state confidently in your head that you’re going to be just as OK on the way back. Finally, imagine yourself back home with friends or family, telling them about the amazing memories you have created. These five steps should all help, and in many cases they can be used to help you deal with whatever is causing you anxiety in any walk of life. Good luck – and happy travels! Hello there. My name is James Mallinson, and I’m the co-founder of a London, UK-based hypnotherapy practice called Fix My Mind. We offer premium, clinical hypnotherapy and have over 25 years’ experience of helping people to get more of what they want and be more of who they want to be. We have more than 55 five-star reviews, and offer a free initial consultation. To learn more, check out our website: http://www.fixmymind.co.uk..
Phobia Names: Why Can’t We Just Agree?